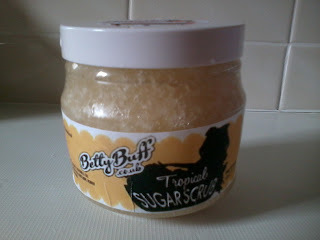 Betty Buff asked if I would like to sample a Tropical Sugarscrub for review. I accepted the offer because this brand promises exfoliation that is gentle on sensitive skin and free from colours, fragrances, chemicals and preservatives. Each scrub sounds delicious – Totally Oatly (suitable for vegans, diabetics & chronic dry skin), Besty Zesty, Tropical, Lime & Ginger, Peppermint, Morning Coffee and Scrummy Choco. Betty Buff even has a Shea Souffle Moisturiser perfect for applying after exfoliation. So what do I think? Firstly the smell of the Tropical scrub reminds me of Pina Coladas (pineapple & coconut). The fragrance did not appear to transfer onto my skin but was still a pleasure to breathe in during application. The scrub is soft and easy to scoop from the container. This is not a fine scrub the sugar particles are large as Betty Buff use granulated sugar. I would prefer more oil in the product as I found the product slightly uncomfortable on my skin especially on my face. I normally go for a finer scrub with particles suspended in cream or large quantities of oil (e.g. Dr Organic and Tropic Skincare). I did apply the scrub to damp skin but without oil or a cream base I found that you lose some product down the plug hole, it does not stick easily to the skin. I do recommend this product especially for those who fake tan and use a body scrub on a regular basis. My advice would be that sensitive skins need to be careful and perhaps Totally Oatly would be the better option. Ellie (the owner & maker of these scrubs) does have eczema so she is aware of the condition. However, I think eczema varies greatly between people and you need to use common sense as you know your skin best. I can say my skin did feel polished after use. 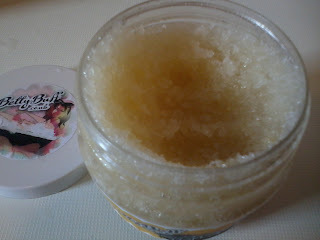 The scrub does have some oil content so my skin was left feeling soft and not dry or tight. Check out Betty Buff’s website and support a small up and coming UK business. The scrubs retail for a very reasonable £8 (plus P&P 250ml jar). The ingredients for the Tropical Scrub – fresh Pineapple & Coconut, Granulated Sugar, Honey, Evening Primrose Oil, Glycerine. Be aware that because the product contains no preservatives it has a shorter shelf life. Has anyone else tried Betty Buff? Do you like using a body scrub? Do you have any other scrub recommendations?